I've got a similar seat myself (just for the driver). It's a Recaro Ergomed ES. This model has an airbag built into the seat that has to be connected to the factory airbag wiring (plug) under the seat so as to comply with Australian regs. I attempted to locate a factory socket to put onto the recaro wiring harness, but that was too difficult. In the end I replaced the factory plug/socket with another commonly available automotive plug/socket instead. That way when I sell the vehicle (many years down the track) I can put the original seat back in (and it'll plug straight in) and put the Recaro into the next vehicle. 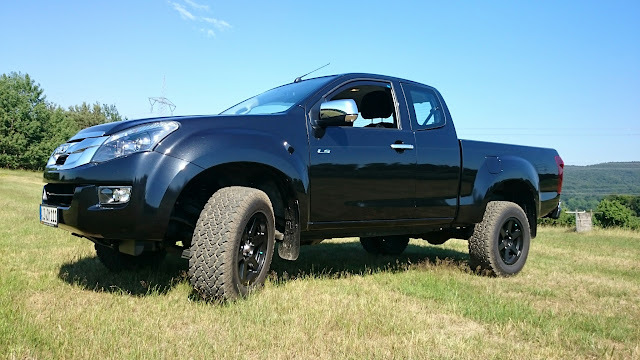 Here in Oz it cost me about $3400 for the single seat and mount to suit the dmax at the time I purchased. As they are imported to Australia I'm assuming the exchange rate will affect current pricing. Obviously the seat can be removed and installed in other vehicles in the future - you just need the appropriate mount kit to suit the next vehicle. I got mine through ARB as they are a distributor. A lot of money, but as I have a crook back - well worth it. 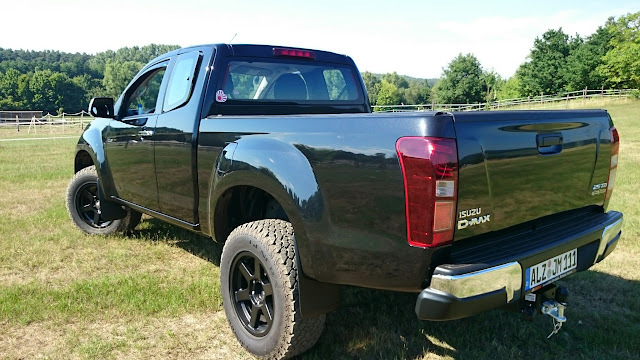 I should note that when I was in the market for a ute - I test drove the Amarok, the ranger and the Dmax - as they were my short listed ones. Due to my back, none of them had a comfortable seat for me, so this was a cost I was going to have to wear no matter the vehicle I chose. I had a different model Recaro seat in my previous 4WD's - but as they didn't have side airbags, I couldn't continue to use it. The 'Ergomed' is a great seat, although you do have to climb in rather than slide in, due to the larger bolsters compared to factory delivered seats. Another option I investigated was second hand seats from other cars that use Recaro seats from the factory - such as some BMW's and the Subaru WRX, etc. Unfortunately these have a very high asking price from wreckers when they can be located here in Perth, so I didn't find it worthwhile going down this route. 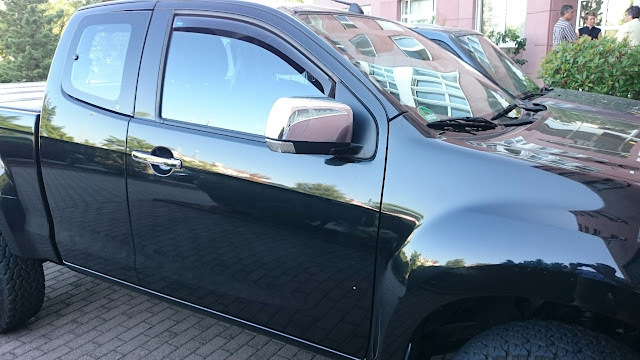 Two weeks ago, my Max received a "power matching"
My Isuzu dealer stands in close contact to Mansory who work togehter with Techtec. Maybe someone has seen the TV-show with the german guy who improves the cars of some rich people in the Emirates. Exectly this man enhanced my Max! It was not such a big thing as i thought before. With a special reader, all engine, gearbox and raildata were read out. This data went on the tuners PC and some (secret) matching was done. After that, the changed data went back into the car's control unit. Pleasant sideeffect: He (Yes! It's a "he") uses nearly one liter less, what i already could notice on my way back home. The torque is impressive. Uphill at 130 km/h on the autobahn you just have to slightly step on it and the whole thing marches on heavily. Very funny! In the "Kasseler Berge" (a very "hilly" part of German autobahn) i must have driven some tears into the eyes of some VW shooting brake drivers. The very often critizised lack of "starting power" (you know, what i mean?) is nearly gone. 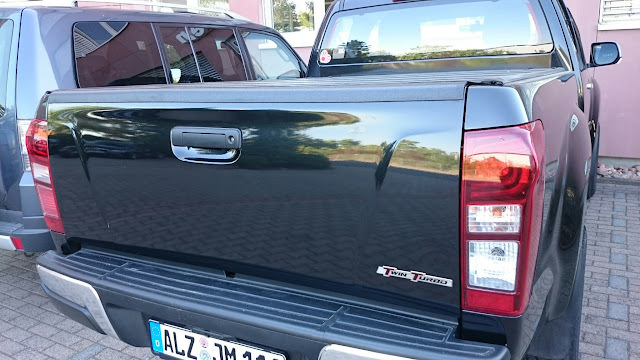 Funnily enough a (by me) personally well known guy from Isuzu Germany was also at the place, to have his Max "done". After a testdrive he got out of his car with a big grin on his face. 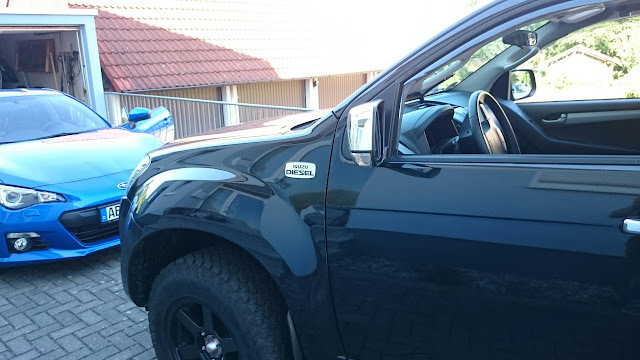 It is planned by Isuzu Germany, to distribute this package officially. With 750,-- Euros it is not cheap but in any case better than every "race chip", because each car is treated exclusively. Last edited by Dynomike on Thu Mar 24, 2016 4:29 pm, edited 2 times in total. 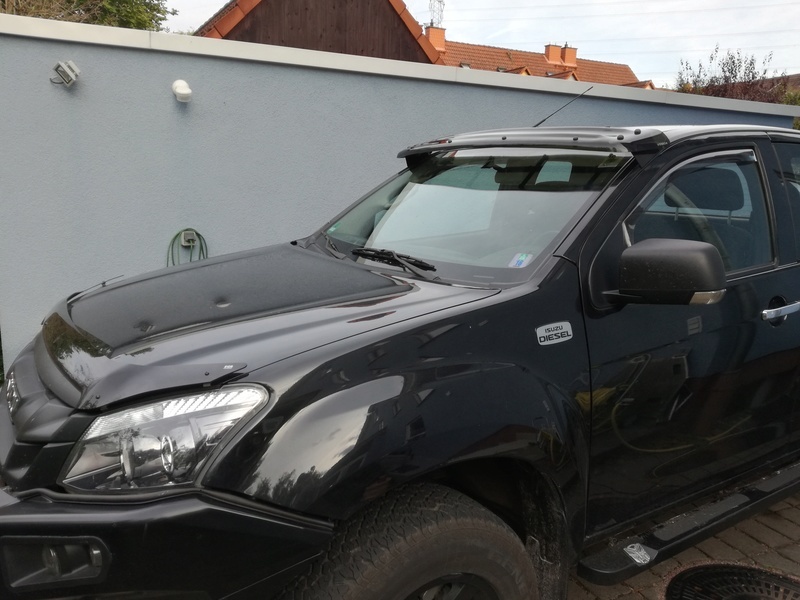 Jörg does the man who 'tuned up' your DMAX have a UK operation? Techtec is a company with 70 worldwide dirstributors. I don't know, whether they do the power matching job everywhere. As i wrote, the "Isuzu-Job" is a cooperation between Mansory and Isuzu. Techtec was just the executive part. 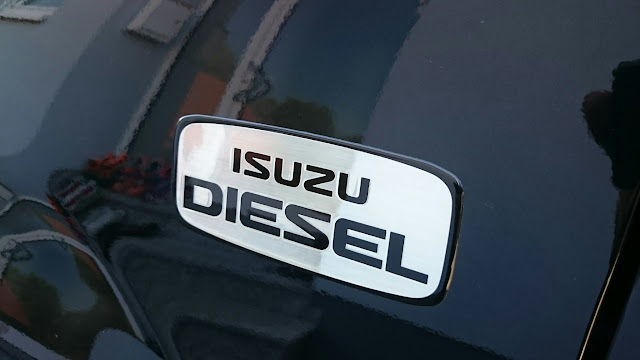 They (Isuzu Germany and Mansory) are planning to build and distribute a "data-stick", which can be purchased at the local Isuzu dealer. I know that they are not parallel to the body. I had to mount these heavy things all alone, so i was glad when the were finally mounted This will be fixed soon. The grille is black again and there are still some minor optical changes, like further "dechroming", to come. The bigger ones are a bullbar, skid plates and a winch, which will come later this year. Also an electrical engine preheater and a stationary battery charger will be installed. Sorry for the late reply. I found them on ebay. Last weekend my Max received a new gimmick, which i've already been searching for all my former cars and which i finally found in the Netherlands. 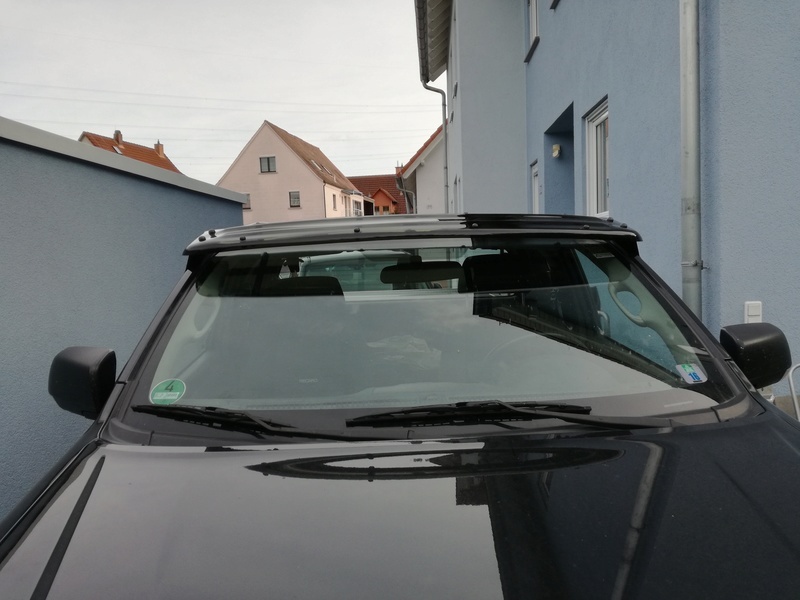 Because of the measurements i've received from a member of our German Isuzu Forum, the installing was not so difficult, but nearly the stroke hit me, when i found six rivets in the huge packet. Man! Drilling holes into the a-pillar?...pheeww! OK,... until now i've never heard of an accident caused by that, so i went on. Befor installing I threw the rivets away and used M5 steel rivetnuts. So i can dismount the sunscreen whenever needed. The whole thing is built very sturdy. The screen itself is made of approximately 6mm acrylic glass or similar. It's boltet on a powdercoated frame built of 20mm steel squaretubes which is screwed to the side brackets. 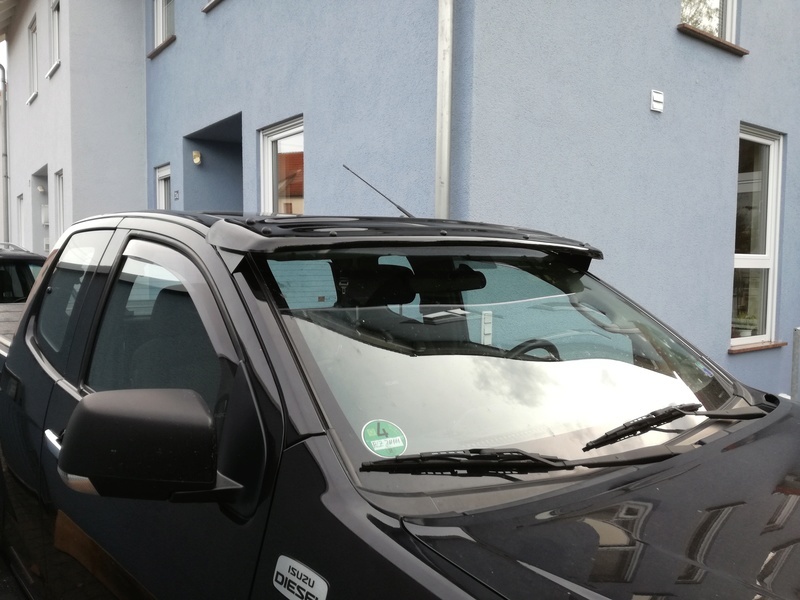 The brackets theirselves are fixed to the a-pillar with the mentioned rivetnuts and 5x20mm screws. This is really bombproof. I like it. Makes "him" looking still a bit more badass. Besides it protects from the sun. Last edited by Dynomike on Mon Sep 26, 2016 7:43 pm, edited 1 time in total.